Yesterday evening, my husband and I decided to go and see a movie. There is a very nice cinema close to our house, a theater where independent films are often screened and in which you can also enjoy a beer or a glass of wine, so I went online to see what was playing there. The selections were kind of "eh"...nothing really jumped out at me. Aside from one subtitled foreign film, which I was sure Brad wouldn't be interested in, most of the offerings were mainstream fare. It was already 6:30 p.m., with most of the shows starting between 7:00 and 7:30. Both of us needed to shower, and since "Snow White and the Huntsmen" was starting in thirty minutes, while "Dark Shadows" wouldn't show for another hour, we decided to go with the latter choice, a decision which briefly struck terror into my heart. You see, Barnabas Collins is precisely why I've always been afraid of the dark. As a very small child in the mid '60s, I remember seeing snippets of the original "Dark Shadows" on TV. I don't think I was supposed to have seen it at all, but it was one of our housekeeper's daytime soap operas, and she liked to watch her "stories" as she was ironing or folding laundry. I suppose she wasn't aware that I already had a wolf living under my bed, or that because of this, it was necessary for me to sleep with a light on in the room I shared with my younger sister, who was somewhat intolerant of me and my irrational fears. What can I say? I had an extremely active imagination, and after hearing a musical story called "Peter and the Wolf", a grey wolf with yellow eyes began sharing real estate with the toys that were stuffed beneath my little cot. Every night, I would check to see if the wolf was still there, reassuring myself that he wouldn't come out if I kept a light on. I'm really not sure if my parents were even aware of this wolf's existence. Had they known, I'm certain they would have addressed the issue swiftly and decisively, given the fact that my sister was so annoyed by my ritualistic night-time illumination requirements. As if harboring a wolf under my bed wasn't bad enough, the glimpse I caught of Barnabas Collins' vampire teeth was enough to incapacitate me for the next two decades. 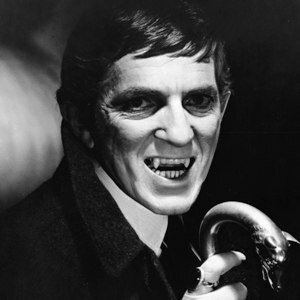 The "Dark Shadows" theme song was sufficiently creepy to steer me in the opposite direction, but one unfortunate afternoon, I wasn't able to immediately exit the room upon hearing that music, and that's when I accidentally saw Barnabas with his fangs, going for blood. After that, I could no longer bear to go down to the basement, which was where my beloved older brother slept. Even with the lights on, the overall ambience was just too scary, and the risk of encountering yet another monster was too great. For many years after that, I hated being asked to go down to the basement to retrieve the laundry or a jar of canned goods. If I absolutely had to go down there, I'd often enlist one of my younger siblings to accompany me. A few years after the "Dark Shadows" incident, I saw an episode of "Johnny Sokko and His Giant Robot" in which an evil doctor poisoned Tokyo's water system, turning anyone who drank the water into a blood-sucking vampire. This necessitated the development of a new ritual. Aside from sleeping with a light on, I now needed to hold my neck in a certain position to avoid being bitten, and I was also compelled to say a thirty minute-long prayer to protect me and all my loved ones from a vampire attack. If I left anyone out of the prayer, I had to start all over again. By the time I was in high school, I'd abandoned the night light and the prayers, but I still couldn't watch horror movies of any kind. I was perceptive enough to know that doing so would only stir up old angst. While all my friends were going to see "Halloween" and "The Texas Chain Saw Massacre", I was content to stay at home, watching "The Love Boat." In college, I made the mistake of attending a campus screening of "Night of the Living Dead", and I cannot begin to describe what a setback that was. I begged my boyfriend to come in and check under the beds and inside the closets of the apartment I shared with three other girls, and from then on, he and his buddies took great delight in doing whatever they could to frighten me when we were out roaming the streets at night. Fast forward 40+ years, and I'm still avoiding horror flicks. A few months ago, my husband and sons watched the ever-so-dreadful "Human Caterpillar", and pretty much laughed through the whole thing, while I hid beneath the covers in our bedroom, using earplugs to drown out the soundtrack's disturbingly incessant screams and moans. It made me sick to think about the premise of that movie, and to know that there really are people crazy enough to attempt such an experiment. I guess I've always had problems separating reality from my imagination, but that's an entirely different philosophical discussion, isn't it? Suffice it to say, I successfully confronted Barnabas Collins last night, fangs and all, and I must admit, I thoroughly enjoyed every moment of that movie. I can't say with certainty whether this experience has emboldened me enough to sit through something like "Saw" or "Hotel Hell", but at least it's a start. Despite the fact that the wolf underneath my bed has long since vanished into harmless dust bunnies, my imagination is still just as active, maybe even more so. Even though it's sometimes been a disability, I wouldn't change a thing about it: my imagination keeps life interesting. Perhaps Albert Einstein was correct in his assertion that "the true sign of intelligence is not knowledge but imagination." After all, it takes imagination to comprehend that there is no bigger illusion than reality. 'Johnny Sokko and his Giant Robot'? Whoa! Take me back! When I was young I loved horror movies. Can't say I like them now, though. There are too many real horrors in the world. I'm glad you liked 'Dark Shadows,' though. Gotta say, though, it's quite a big jump to go from 'Dark Shadows' to 'Saw.' I'm not sure I'd take the leap if I were you! heh heh, re: Dark Shadows to Saw...i think that is sage advice, janene!